A very good morning! It is difficult to express in words, the shock and surprise I felt when the Papal Nuncio Archbishop Okolo told me of Pope Francis¹ wish to appoint me as the next Bishop of Cork & Ross. To be honest, it seems very daunting at this stage and I am very aware of my own human limitations but I have always answered God¹s call, each day, to serve in ways I would never have planned or expected. Thankfully God has always given me the grace and strength to do this, with the help of God¹s people and I am really excited by the challenge. 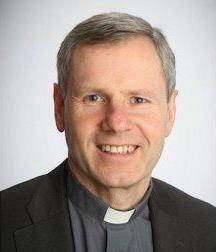 In recent years I have had two wonderful experiences of priestly ministry here in this diocese. I celebrated, on the occasion of their marriage, the wedding of two friends in the historical setting of Saint Finbarr¹s Oratory, Gougane Barra, in the parish of Uibh Laoire, Inchigeela, a place steeped in the history of our Christian faith lived by people over many centuries. On another occasion I concelebrated Mass here in the Cathedral of St. Mary and St Anne. I was accompanying, to a very warm welcome here, the Young Adult Gospel Choir from our parish of Our Lady of Victories, Ballymun Road, Dublin. The Gospel Choir led the liturgical music at a Saturday evening vigil Mass while we were here in Cork. The choir was participating in a choral competition as part of the Cork International Choral Festival. I am conscious of those who have felt let down by the Church and are just hanging in there¹. I encourage you not to give up. I cannot pretend that leaving my life and ministry in Dublin will be easy. I want to thank those I have collaborated and worked with in the Holy Cross Dublin Diocesan Centre and the Diocesan Offices and the faith community of the parish of Our Lady of Victories, Ballymun Road where I have served as a priest over the last almost ten years. I would like to thank Bishop John Buckley for his genuine welcome and for all his encouragement and support to me over the last two weeks. I know well that Bishop Buckley is a much loved pastor of the diocese during his time as auxiliary bishop and then bishop over the last thirty-five years. While I wish him every happiness in his well-deserved retirement, I hope that he will be present and active and feel welcome in diocesan occasions and celebrations in the years ahead. I hope to be able to draw on his wisdom and experience. I wish to express my appreciation to acting diocesan secretary Father Michael Keohane and to the cathedral administrator Father John O¹Donovan and to all here in the Cathedral of Saint Mary and Saint Anne for their work in organising this morning¹s announcement and for their welcome. I wish to acknowledge the presence of Archbishop Patrick Coveney Apostolic Nuncio<https://en.wikipedia.org/wiki/Nuncio Emeritus<https://en.wikipedia.org/wiki/Emeritus> to Greece<https://en.wikipedia.org/wiki/Greece> now living in his diocese of origin, Vicars General Monsignor Kevin O¹ Callaghan and Monsignor Aidan O¹Driscoll and the priests religious and so many people of the diocese, including the pupils and teachers from the local parish schools, gathered here this morning. One of the scripture readings just a few days ago this Lent from the prophet Ezekiel (47:1-9.12) talks about God¹s love and our love as a stream of water, bringing life to all wherever it flows, reminding us of the love and light Jesus brings all of us, especially the weak and vulnerable, those on the margins. As I, in these very first few significant steps, walk among you and prepare to begin my ministry with you, let us pray for one another. As a gesture reminding each of us of our baptismal call from God I would like, as a help on the journey, to ask Bishop Buckley and others gathered at the font from the local community to bless us, as we bless one another and to Œsplash me¹ this morning with some local holy water, blessed before we began Lent, as we journey out together. For media contact: Catholic Communications Office Maynooth: Martin Long +353 (0) 86 172 7678 and Brenda Drumm +353 (0) 87 310 4444.